"Goldfinger, he's the man, the man with the Midas touch....A spider's touch....Such a cold finger beckons you to enter his web of sin....But don't go in!" 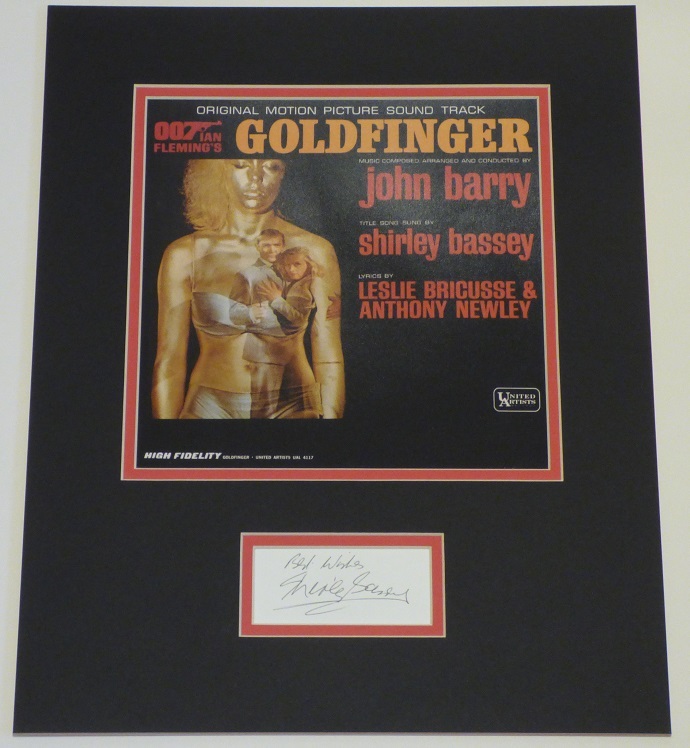 This quality matted display contains a reproduction print of the Goldfinger soundtrack, together with the signature of the legendary Dame Shirley Bassey who sung the immortal classic. 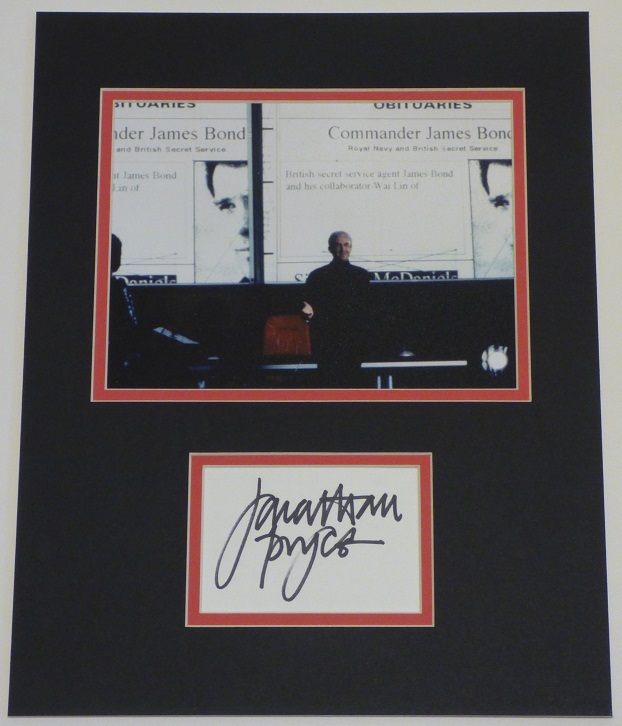 This item has been matted using acid free materials to an overall size of 15x12 inches - this would be perfect for any fan of 007 or music - or even 007 music! Goldfinger begins innocently enough with a murder, James Bond soon finds himself investigating Auric Goldfinger, a gold dealer who the Bank of England suspects is stockpiling huge amounts of gold bullion. However, he soon uncovers a far more sinister plot called Operation Grand Slam and has a fair bit of bowler-hat-dodging to do from Goldfinger's manservant, Oddjob. Dame Shirley Veronica Bassey, DBE (born 8 January 1937) is a Welsh vocalist whose career began in the mid-1950s, best known both for her powerful voice and for recording the theme songs to the James Bond films Goldfinger (1964), Diamonds Are Forever (1971), and Moonraker (1979).In January 1959, Bassey became the first Welsh person to gain a No. 1 single. In 2000, Bassey was made a Dame for services to the performing arts. In 1977 she received the Brit Award for Best British Female Solo Artist in the previous 25 years. Bassey has been called "one of the most popular female vocalists in Britain during the last half of the 20th century." Goldfinger was an obsessive megalomaniac, his main lust was for gold and he would do anything to increase his stocks. Goldfinger is a classic case of a crazed criminal, he appeared to be quite friendly from a distance often laughing and smiling, however this was all selfish applause for himself. Goldfinger would even go to the extend of killing over 60,000 people just get more worth out of his gold. Goldfinger's plan was to use the deadly Delta-9 nerve gas to kill Fort Knox army personal and raid the gold stockpiles, setting a small atomic bomb supplied by Red China on timer, the explosion would render the gold radioactive for 58 years. This puzzled Bond at first as to why Goldfinger wouldn't want to steal the gold, then it was unravelled, by doing this the Western economy would be in crisis, Goldfinger's gold stocks would be worth a great amount more and Communist China would rejoice as they would not be effected by the downfall of the economy.